I’m in the middle of revising a brand new book and I’m very excited about this story. But I realized I need to concentrate heavily on revisions and make sure this story is the best it can be before I submit it to my dream publisher. So I’ve decided to revise by Post Its. I’m hoping you will contribute today with your suggestions for revising by Post Its! This will help us all become more thorough revisers. To start, I’ll share a few of my Post Its. These are some of the main issues I struggle with. Use all FIVE senses! SIGHT. HEARING. TOUCH. TASTE. SMELL. I think with my latest manuscript especially I need to concentrate on incorporating all of my senses. What is my Point-of-View character seeing, hearing, touching, tasting and smelling? I think this automatically helps with using active language and showing instead of telling. I tend to do a lot of: “Andy was sitting on the lawn.” Instead of the more active: “Andy sat on the lawn.” When I’m writing the first draft I try not to think about using active vs. passive language because it slows down the story. But going through revisions, I try to make sure that each sentence has been evaluated. I’ll always need to use some “to be” verbs, but limiting them will help the reader engage in the story. Of course, I still think focusing on using the five senses is the most important thing. Point-of-View (POV) shifts easily sneak up on me. Even simple phrases can lose the reader with POV. I always have to remember to include what the POV character is thinking, feeling, seeing and doing. Every sentence counts. One ambiguous sentence can pull the reader from the story. Set the scene with ACTIVE setting! I tend to forget to ground my scenes. At the beginning of each scene the reader needs to know where the characters are. This doesn’t need to be written in long exhaustive paragraphs. I think the description-heavy style of writing is trending out. I usually try to summarize the location and time setting in one to two sentences with something that relates back to my POV character. Make sure each scene has a conflict! I go through each scene and make sure that each character has an overarching goal and one for the scene. With my new story, this is a lot easier because for the first time in a full length novel, I only have two POVs, the hero and heroine. I built the world so they would have continuous conflict between them, so this really helps when trying to clarify the conflict for each scene. I think of scene as the action and the sequel as the reflection on the action. I try to keep my sequels short to keep the story moving forward. I hope you’ll get involved in the comments! If you use Post Its, tell us what they say. If you have key phrases that help you in revisions, tell us that, too! We’d really love to hear your reasoning because I’m sure we can all learn from your suggestions! Kinley Baker read her first romance novel at the age of thirteen and immediately fell in love with the hero and the genre. She lives with her husband and her dog, Joker, in the Pacific Northwest. She is the author of the fantasy romance series, Shadowed Love. 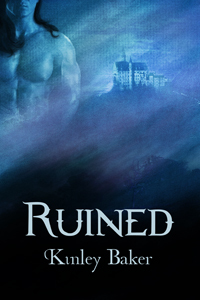 Book one, RUINED, released in July 2011 from Crescent Moon Press. You can find Kinley at www.kinleybaker.com, at her blog http://authorkinleybaker.blogspot.com or on Twitter at www.twitter.com/kinleybaker. I've revised with post-its. I read through the entire book and make comments with the post-its when I see problems. After I'm done with that, I fix the problems I saw from the post-its and then do line editing. So I think that might be a little different from your method, but man, sometimes for a small moment, I wish I didn't do such a thorough job with post-its since I catch A LOT of things with them. Thanks, Lisa! Yes, I'm trying to use it to remind myself of my weaknesses. Hopefully it will work out. Thanks for commenting today.